London: George Routledge and Sons, 1939. First edition of this collection of essays by the Nobel Prize-winning economist. Octavo, original cloth. Near fine in a very good dust jacket. Rare in the original jacket, this is only the second example we have encountered. Hayek wrote the eight essays comprising this work over the course of ten years. The first and foremost of these lends its title to the book and is intended to be "a revised version of the central argument" of his important and controversial Prices and Production. 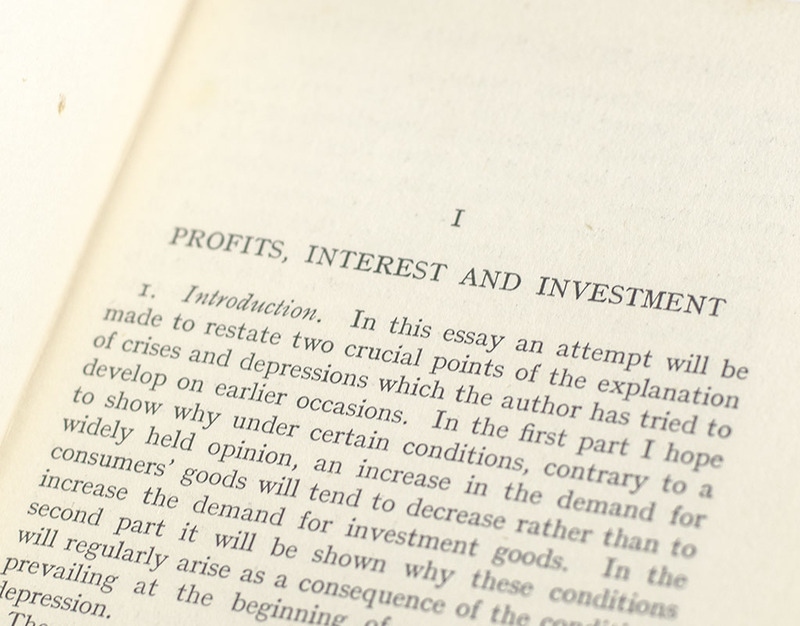 The volume also includes: "Investment that Raises the Demand for Capital," "The Maintenance of Capital," "Price Expectations, Money Disturbances and Malinvestments," "Saving," "The Present State… of the Study of Industrial Fluctuations," and "A Note on the Development of the Doctrine of 'Forced Saving." 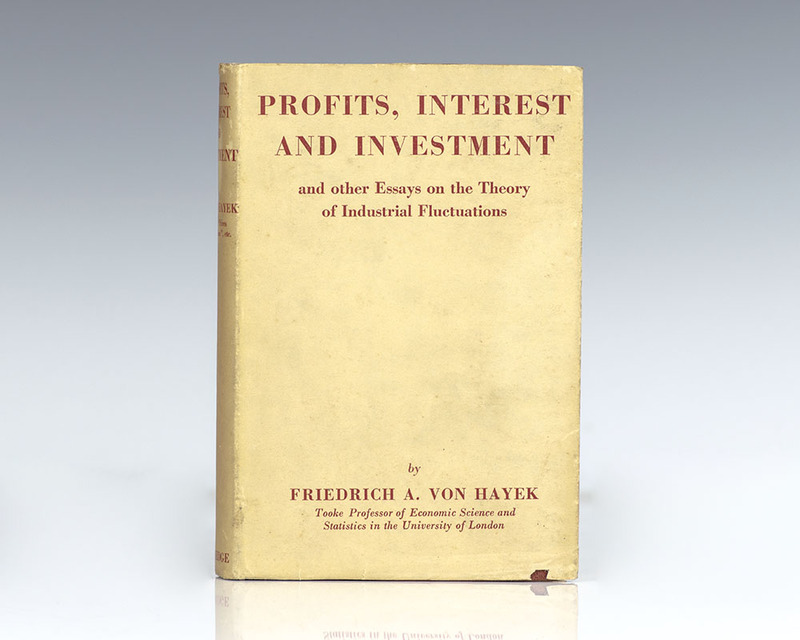 In Profits, Interest and Investment, "Hayek recognized that expectations in the rate of interest and entrepreneurial interpretations of intertemporal price movements can have an important effect on the course of the trade cycle. That is, prices are signals, not marching orders" (New Palgrave II:612-613). Hayek, Friedrich August von [F.A. ]; Foreword by Milton Friedman; Edited by Fritz Machlup. New York: New York University Press, 1976. First edition of these collection of essays on the Nobel Prize-winning economist. Octavo, original cloth. Fine in a very good dust jacket with a light wear to the extremities. Signed by Milton Friedman on the front free endpaper and F.A. Hayek on the title page. We have never encountered these two Nobel Prize-winning economists signature in the same volume. Edited by Fritz Machlup. Essays by William F. Buckley, Jr., Gottfried Dietze, Ronald Max Hartwell, Shirley Robin Letwin, Fritz Machlup, George C. Roche III and Arthur Shenfield. Housed in a custom half morocco clamshell box. Chicago: University of Chicago Press, 1973-1979. First editions of the economist’s magnum opus. Octavo, 2 volumes, original black cloth. Volume one is inscribed on the front free endpaper by F.A. 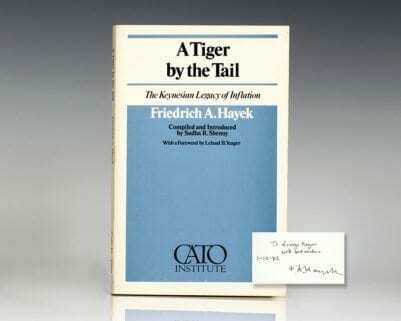 Hayek to his colleague and legal scholar, Theo Mayer-Maly with his bookplate below. Mayer-Maly’s work Rechtsgeschichte der Freiheitsidee in Antike und Mittelalter is cited in volume one of Law, Legislation and Liberty. 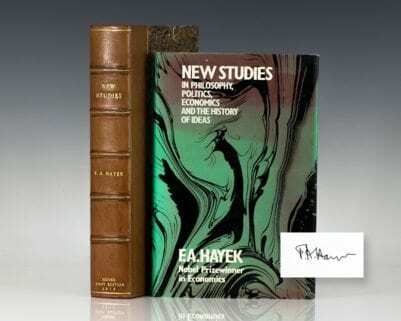 Both volumes two and three are also signed by Hayek. Each volume is fine in near fine dust jackets. We have never seen or handled a complete set signed of this cornerstone work. Housed in a custom half morocco clamshell box. A fine association. Rare and desirable signed and with noted provenance. London: Routledge & Kegan Paul, 1949. First British edition of this collection of economics essays rejecting socialism in favor of true individualism. Octavo, original cloth. Boldly signed by F.A. 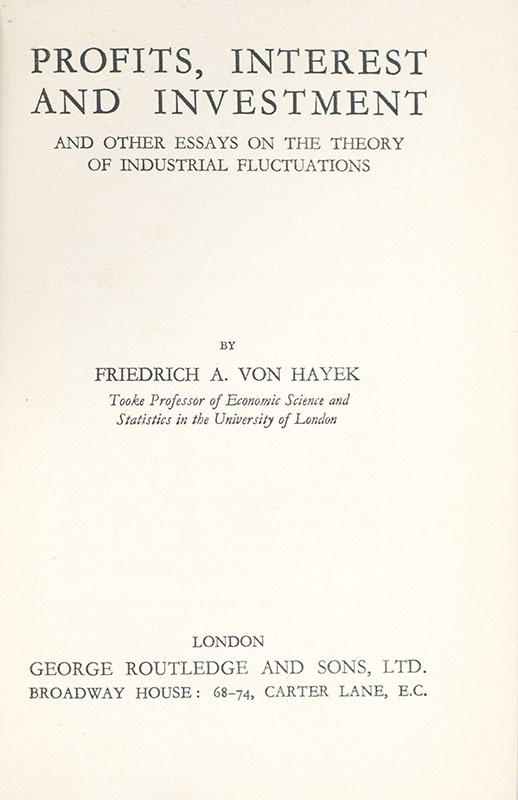 Hayek on the title page. Near fine in a near fine dust jacket with a few small closed tears. Housed in a custom half morocco clamshell box. Rare and desirable signed. London: Routledge and Kegan Paul, 1960. 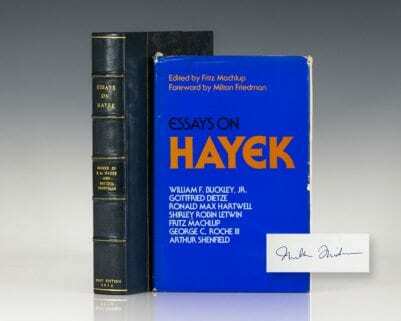 First edition of Hayek’s classic statement on the ideals of freedom and liberty. Octavo, original cloth. Boldly signed by F.A. Hayek on the title page. Fine in a near fine dust jacket. Housed in a custom half morocco clamshell box. The Sensory Order. An Inquiry Into the Foundations of Theoretical Psychology. Chicago: University of Chicago, 1952. First edition of Hayek’s foundational study of cognitive behavior—”an exercise in profound thinking.” Octavo, original cloth. Presentation copy, inscribed by the author on the front free endpaper, “To David Grene with all the best wishes from F.A.H. Nov. 52.” The recipient was David Grene, a professor of classics at the University of Chicago from and co-founder of the Committee on Social Thought. In 1950, Hayek left the London School of Economics for the University of Chicago, where he became a professor in the Committee on Social Thought. Near fine in the rare dust jacket with some wear to the spine and extremities. Housed in a custom half morocco clamshell box. A nice association. London: Routledge & Sons, 1944. First British edition of one of the most influential and popular expositions of classical liberalism ever published. Octavo, original black cloth. The British edition was published in March of 1944, preceding its American counterpart, which was published later that same year in September. The Counter-Revolution of Science: Studies on the Abuse of Reason. Glencoe, Illinois: The Free Press, 1952. 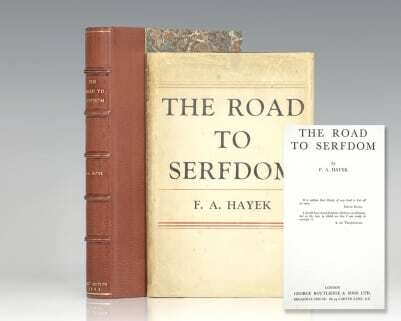 First edition of Hayek’s critique of reason, written at the same time as The Road to Serfdom. Octavo, original cloth. Fine in a very good dust jacket. Signed by F.A. Hayek on the front free endpaper. Housed in a custom half morocco clamshell box. Rare and desirable signed. New Studies in Philosophy, Politics, Economics and the History of Ideas. Chicago: The University of Chicago Press, 1978. First edition of this collection of writings by the Nobel Prize-winning economist F.A. Hayek. Octavo, original cloth. Boldly signed by F.A. Hayek on the front free endpaper. Near fine in a near fine dust jacket with light shelfwear. Housed in a custom half morocco clamshell box. First edition of one of the most influential and popular expositions of classical liberalism ever published. Octavo, original black cloth. The British edition (which this example is) was published in March of 1944, preceding its American counterpart, which was published later that same year in September. Light rubbing and small contemporary name to the front free endpaper, an excellent example in the original dust jacket with some expert restoration. Housed in a custom half morocco clamshell box. Rare in the original dust jacket.